Nut milks are a lot more popular than they were a few years ago, and with their creamy nutty taste you can understand why they have become a much-loved substitute for those seeking an alternative to dairy. Offering a host of hair and health nutrients including Vitamin E, magnesium and copper, with the added benefit of being lactose and cholesterol free, almond milk is both delicious and nutritious, and can be drunk as is or used in smoothies, cereals, soups and desserts. If you’re one of those people who drinks a lot of almond milk, it is so easy to make your own instead of resorting to store-bought: all you need is water, a blender and a nut milk bag or fine sieve for straining and voila! Almond milk. 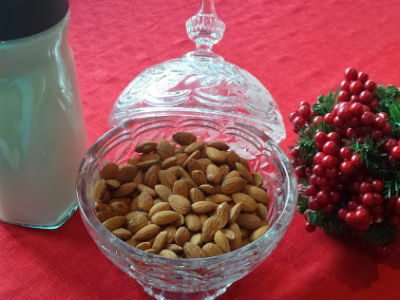 Before you throw your almonds in the blender though, you should soak them overnight to make them more digestible. Soaking nuts allows the nutrients to become more readily available, just as they are in nature when they are planted and watered to stimulate germination.